It may seem unnecessary to post a recipe for vinaigrette. But although I will admit to doing it myself sometimes when I’m in a hurry, putting a few ingredients in a jar and shaking it does not result in true vinaigrette in my opinion. 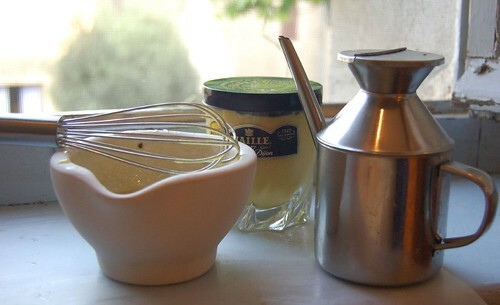 Real vinaigrette is an emulsion with the consistency of thin cream, and a hopeful shake will not emulsify oil and liquid; it just blends them temporarily. So this is how you do it properly. It takes longer, but one benefit is that you need less of it, because it sticks to your salad leaves better! A note on proportions: you often see recipes that specify two or three times oil to vinegar. This will be far too acid; you need to aim for 4 to 5 times. So measure out roughly that amount of oil, and taste the dressing as it thickens so you can adjust the amount to your taste. Theoretically you can make vinaigrette simply with oil, vinegar, and seasoning, but it’s a lot easier to emulsify if you start with either garlic or mustard. If using garlic, peel the clove of garlic, put it in a mortar, sprinkle with salt, and pound it to a paste. If using mustard simply put a teaspoonful (or more to taste) in the bottom of your mortar or small bowl. Add a tablespon or two of vinegar; the classic is red wine vinegar, but I also like to use cider or sherry vinegar. You can use balsamic, but although it tastes good it does have the unfortunate effect of making your vinaigrette look like gravy. Some salads are nice with lemon juice (e.g. avocado). Stir the vinegar into the garlic or mustard. Now take a small whisk and start beating the oil in drop by drop, as if you were making mayonnaise. I use a little oil can that drizzles the oil in a thin stream; it’s perfect for this. You can start adding it a little faster as it thickens. Taste as you go until the acidity is right for you. Add salt and pepper to taste. Done. Make sure your salad is thoroughly dry before adding the dressing and tossing to coat. You can store leftover dressing in a jar and use within a couple of days; if you put it in the fridge it will probably separate, but shaking the jar before use will make it look presentable again. Variation: you can make vinaigrette with single cream, replacing some of the oil; it’s less fattening (yep, cream is lower fat than oil!). In this case it’s easier to make; just mix together 1 tbs mustard, 2 tbs vinegar, 4 tbs olive oil, and 2 tbs cream. This is particularly nice on a simple green salad with walnuts and diced ham or cheese.